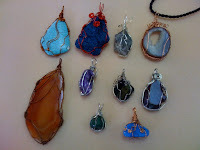 This is another wire wrapping class that I took. It was taught by Brenda Posh at Sea of Beads. It was very similar to the wire wrapping class taught at Nomadic Notions by Mick. I preferred Mick's approach in terms of techniques, but Brenda's wire wrapping examples are some of the finest pieces I've ever seen. I wish I had pictures of her pieces as they are all quite stunning. She's an amazing artist! Here is a class pic, that I took of all the student pieces. My two are the turquoise and copper ones.